Simply Gluten Free Fun And Giveaway Day!! There is a new Gluten Free and Allergy Friendly magazine on the block that is about to hit news stands in November. The woman behind the magazine is Gluten-free living expert Carol Kicinski, she is also lady behind the Simply Gluten Free Website and the author of the books, Simply…Gluten Free Desserts and Simply…Gluten Free Quick Meals (which two lucky winners will be receiving as part of this fun giveaway package). “Working in tandem with the magazine’s Editor-in-Chief Wendy Gregory Kaho (a veteran magazine editor, blogger, freelance writer, and a mother of two celiac children), Kicinski has recruited the talents of a team of well-respected and highly popular bloggers from the Web’s allergen-free community to serve as the magazine’s writing staff. And trust me when I tell you that you will NOT want to miss the first issue. This one is going to start off with a bang! You can sign up for your subscription today and receive 70% off the cover price right now! Oh. And P.S….I will just include here that I am proud to announce that I will be one of the contributing writers and an Associate Editor for the magazine. And…while I just happen to be on the topic of Simply…Gluten Free, I want to share with you her latest cookbook as well. This is just the book for us busy moms dealing with food allergies and special diets…all of the recipes are obviously gluten-free, but most of the recipes can also easily be adapted to many other food allergies as well, including many vegetarian options. I love how Carol lays out the book, with all of her quick meals being set up into simple menus that make from entertaining for a group to a quick meal at home with the family seem totally doable. She also has an amazing spread of her beautiful photography of many of the dishes. And because I said that today is all about Simply…Gluten Free today, I am doing a fun giveaway package for 2 lucky winners. Two people will win both a Copy of Simply…Gluten Free Quick Meals AND a Subscription to the new Simply Gluten Free Magazine. To enter, you just need to do one of the following. BUT…if you do all three, you get three entries into this giveaway. 😉 Just make sure to leave a separate comment for EACH one that you do. Each comment qualifies you for an additional entry. Simply…leave a comment here telling me how long you have been gluten-free or allergy-free. Simply…follow Me, Cook It Allergy Free, on Facebook (or tell me if you already do). Simply…follow Simply Gluten Free Magazine on Facebook (or tell me if you already do). The contest will end on Wednesday, August 22nd at 9.am PST. The winners will be announced then. You must be at least 18 years old to enter. UPDATE: THIS CONTEST IS NOW CLOSED. WINNERS WILL BE NOTIFIED BY EMAIL! following Cook It Allergy Free on Facebook. following Simply Gluten Free Magazine on Facebook. I have been gluten free (with a one week exception) since May 4th – and I can walk again! I am following Cook It Allergy Free on Facebook. I have been gluten-free and allergy-free for 3 months! Already follow Simply Gluten-Free Magazine on Facebook. I am following Simply Gluten Free Magazine on Facebook. I’ve been gluten free for about 20 months now. I also follow you on FB! Thanks! I have been gluten free since August 2011. I just recently have gone Gluten free in June due to a 2 1/2 year battle of feeling not well. It took that long to discover that I have an allergy. Now feeling fantastic and would love a new resource to help me with this new journey! We’ve been gluten, dairy, corn and egg free in our house for almost 4 years. Man do I rely on blogs like this!!! Following Simply Gluten Free on FB. Can’t wait to see whats next for them! Have been allergy free for 6 years – still need new recipies!! Gluten free (and feeling fabulous) since March 2011–thank you for all of your inspiration along the way! I have been gluten free for about 2 1/2 yrs now. I do follow Cook It Allergy free on FB and following Simply Gluten Free Magazine on FB. Congrats to you all! This is sure to be a great new addition to the gf magazine world. Would love to win a subscription. 🙂 I’ve been gluten-free for 3 years now…although it feels like much longer (in a good way). Since April 2011, but diligently GF since Jan 2012 when I found out I have Hashimoto’s. I have been gluten free for 3 yrs and 10 months . I like Simply Gluten Free Magazine on FB. I’ve been gluten- and dairy-free for four months. I also ‘Like’ Simply Gluten Free Magazine on Facebook! I have been gluten free for a couple months and I love it. I would love to get my hands on this giveaway so I can try out some new recipes! I was diagnosed with a wheat allergy and several others a year ago this week. I’ve been eating allergy free since then! I have been gluten free since my diagnosis in May of this year. I already follow you and the mag on Facebook. Thanks for all the great info! I have been gluten free for 2 years now. My daughter was diagnosed with Celiac Disease 7 years ago. Since then we have become a gluten-free family. Not always an easy task but with help from web-sites like yours it has been a fun challenge. Around 1 year now 🙂 it has been an elimination process. I have been gluten and dairy free over three years now. Your website helped me a lot when I was first learning how to cook without gluten and dairy – so thank you! And good luck in your new venture. I have been gluten-free since the last Tuesday of September 2011. How’s that for precise? My gastro issues resolved almost immediately. The neuro problems? Not so much, but I’m hopeful. I have been gluten free for 9 months and still learning. I really Love all the information you share. I’m following/have liked “cook IT allergy free” on Facebook. Entry No. 2 – yeah! I’m following/have liked “Simply Gluten Free Magazine” on Facebook. Entry No. 3! Woo hoo! Oops! Forgot to add this – I already follow you on Facebook and just “liked” Simply Gluten Free” today. I have been gluten free since October 2011 and just recently my 6 yr old daughter was diagnosed with dairy, egg, and peanut intolerance. Going dairy free has been a lot tougher than just gluten free. I’m so happy to have found your website!! I now follow Simply Gluten Free Magazine on FB and can’t wait for the first issue! Thanks!! I follow your blog and Facebook for both. I have been Gluten Free for 3 years and I am stilling have a hard time! Your blog has help me learn new things. Thank you for a chance to win your giveaway. I”ve been gluten free for 3 years, or is it 4? Grain free (mostly) for the past year. still working on healthiness to be sure. I have been gluten-free for 3 years now. I follow Simply Gluten Free Magazine on Facebook under Simran Silva. I’m not gluten free, but my almost three year old daughter has celiac disease (was diagnosed last summer after getting extremely sick (even quit walking)). So, because of her I cook gluten free for the family. It has made immense difference and our little girl is happy and healthy again! I just “liked” both Cook it Allergy Free and Simply Gluten Free Magazine on Facebook. Been Gluten Free for about one and a half years. Loving all the great info here and on related links. My son (also GF/CF) and my other son (glutenous) both have loved the recipes I’ve tried from here. Following you, and Simply Gluten Free Mag… and subscribed to the mag. Can’t wait for the first issue! I’m coming up on 2 years now gluten-free but am about to be tested for other types of intolerances as well. I know I have celiac but please, please, don’t tell me I have to give up dairy, soy and/or corn! I have been gluten free since April. It has been one of hardest, but best thing ever. I have been gluten free for 7 months! I also like Simply Gluten Free Magazine on Facebook. I have been gluten- and dairy-free since June, and I’m feeling great now! I have been gluten free for 10 yrs. Still having some digestive issues due to other intolerances, but at least things are better. I follow cook it allergy free and simply gluten free magazine. Still working on becoming allergy free. My son has a very limited diet due to allergies. I have been gluten free for 1 year and 8 months. I’ve been gluten free for close to 3 years now…and…have a list of other food allergies, as well. It’s been quite the challenge to say the least! I am also as a fan of both on FaceBook! I am so glad I found your blog! I have a 9-year-old son who has high-functioning autism and is on the GFCF diet. He has been on this diet for a couple of years now. It has been challenging but it is getting easier. I am enjoying the recipes I have found on your blog and will be making them for his school lunches when he goes back next week! Thanks for helping make it easier to cook/bake gluten-and-dairy-free! Hope to win so I can find out more about the Simply Gluten-Free magazine too and get some more great recipes for my son! I’ve liked you and Simpy Gluten-Free on FB too! Thanks! I have been gluten free for 1 month. I was diagnosed with Celiac Disease twelve years ago and have been gluten free since that time. Thank you for making life much easier! I am going to click “like” on Cook It Allergy Free and Simply Gluten Free Magazine on Facebook. I have been GF for a year and a half after being diagnosed with Celiac. I can’t believe how a little protein like gluten can reek so much havoc on a body. I truly appreciate your site and have recommended it to others I know struggling. I follow you on Facebook and get your emails! Thanks!!! I follow Simply Gluten Free on Facebook! Looks great! I have been gluten free for over 12 years now! I love all the new information and LOVE all the recipes, thank you for all you do, following both the mag and your page on facebook now! I’ve been gluten-free for a little over a year since being diagnosed with celiac disease. We’ve shifted my son to gluten-free this summer to see if it helps with his behaviors, as he has Asperger’s. I saw the announcement about Simply Gluten Free a few days ago and already follow them on Facebook. We are a family of 5 who are ALL gluten free. From 5 years ago to the youngest going gluten free 1 month ago. We also all suffer from a whole list of food allergies as well. Finding new exciting meals for out family is quite a challenge. I am now following/liked you on cooking IT allergy free. I am now following /liked on facebook Simply Gluten Free Magazine. I have been gluten free for 2 months now. I already follow you and the magazine on fb. I have been gluten free for over 3 years now and I follow Cook it Allergy Free on FB. I’ve been gluten, dairy, eggs, milk, cheese free for a little over a year and will be forever. (I liked you on your facebook and also liked the magazine, and commented on my facebook about this.). I have been Gluten free for 13years. I have have followed Cook it Allergy Free on facebook for a while. I have followed Simple Gluten Free Magazine on facebook for a while. We’re still new to gluten-free….our son was just diagnosed with allergies to wheat 5 months ago. Of course you are a contributing writer and associate editor! Who wouldn’t want the best?!? I have been allergy free for 6 years now! I am not 100% gf but do eat a lot of gf foods! I follow you on Facebook! And I liked Simply gf on Facebook too! I am just starting the gluten free lifestyle. I am trying to learn as much as I can about becoming gluten free and this website and magazine seem like great resources. Thanks! We have recently discovered that 5 years of extreme excema on our 5 year old daughter has been because of a gluten intolerance/reaction. So we are on a mission to educate and change the way we eat. So glad we found the answer! I just started following you on Facebook! I’ve been Gluten Free for 5 yrs. now, after being diagnosed with multiple allergies. Just started following te magazine. Excited to learn more! I already “like” Cook it allergy free on Facebook. I just signed up to “like” Simply Gluten Free Magazine on Facebook. Love your site. Have two daughters that have developed this gluten problem in their 30’s cause of thyroid issues. Have son in 20’s that is headed into same issue. Love the help and subport found on your site that makes the confusion of how and what to try to keep them healthy. Thanks, can’t wait for magazine. My son and I have been gluten free for six years. He has multiple allergies. I am only sensitive to gluten. Thanks for the amazing giveaway! Gluten free 10 days corn free almost a year. 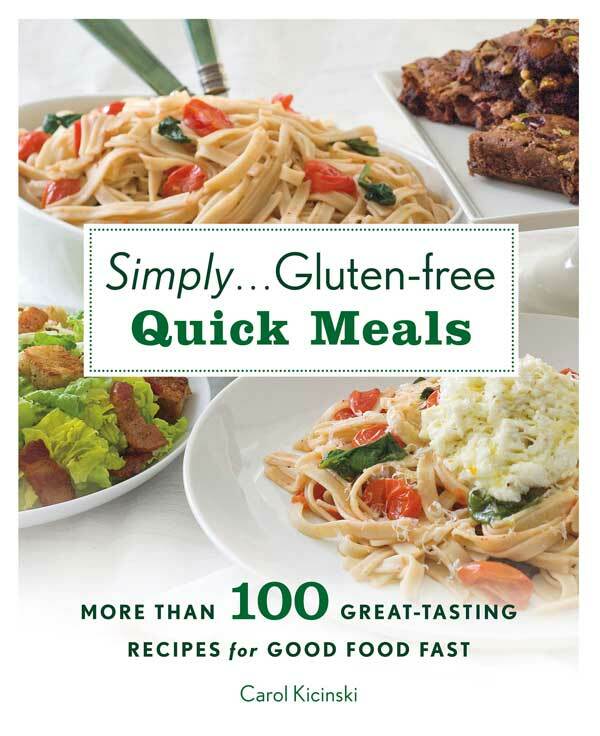 I liked Simply Gluten Free magazine on Facebook! I follow Simply Gluten Free Magazine on FB. I have liked both facebook pages. Looking forward to the magazine coming. I am only 1 year into this new life style and am thankful for all the facebook pages, I have learned so much that has helped me transition into a gluten and dairy free lifestyle, (and like it). I have been GF to help control my endometriosis symptoms since March 2011. I recently also gave up Dairy in an effort to further alleviate the symptoms. Magically, when I gave up gluten, all of my icky GI issues also disappeared! I have been dairy free for 10 years. I love to cook and have a brother who is gluten intolerant. I’ve been gluten free for 5 weeks (this time around) and it will have to be for life this time as I’ve recently been diagnosed with an autoimmune disease (Hashimoto’s Thyroiditis). I first went gluten free in 1995 and then again in 1998 after allergy testing revealed sensitivities to gluten and many other foods. I couldn’t keep it up with my heavy travel schedule for work. (Usually when I fly out of state for meetings, the contractors we meet with announce that we’re not taking a lunch break and that they have catered in lunch so we can keep working – and it’s usually pizza, sometimes spaghetti, or sandwiches or wraps and always brownies and cookies). Eventually I gave in to the temptation and started eating gluten again and then all bets were off. I went on the Specific Carbohydrate Diet (gluten free, grain free, etc) in 2006 due to many health issues and lost a ton of weight and felt better than ever. I lasted almost 2 years that time before giving up. I’m hoping that this new commitment to GF will last the rest of my life, because my health and the rest of my life depend on it. I follow Simply Gluten Free Magazine on Facebook. I have been gluten free for 3 1/2 years. I have been dairy free for yeras (since my son was diagnosed with a severe intolerance), and gluten free since November 2011. It has been interesting, and quite a change for the three of us at my home. The magazine and book would be simply amazing help for me and my family, especially for me, who am the cook and meal planner of the house. Both the book and the magazine sound great and I will definitely be checking them out! I like cook IT allergy free on facebook! I also like Simply Gluten Free Mgazine on facebook! I have been gluten free for 5 1/2 years. I already “liked” cook IT allergy free on facebook. I already “liked” Simply Gluten Free magazine on facebook. I’m following Simply Gluten Free on Facebook! I have been gluten free for 2 weeks after years of pain, surgeries, and medicines! I’m so glad that I have finally realized the culprit, and I can begin living life again! I’m also following cook IT Allergy Free on Facebook! I’ve been progressively avoiding gluten, dairy, and other allergens for at least 3 years now. This is exciting that there is now a cookbook and a magazine dedicated to people like us! I just now followed Cook It Allergy Free and Simply Gluten Free Magazine on Facebook! I have been gluten free and allergen free for two years. I’ve been dairy-free for 4 1/2 years, and gluten-free for about 8 months! And I follow the mag on FB! I first went gluten free about 2 1/2 years ago when my second daughter was born since she reacted to the gluten through my milk. A year later I started having it again and realized it made me feel awful! I have been mostly gluten free since then…and generally feel so much better if I stick with that. As a family we are working toward being mostly grain free (primal/paleo) with occasional gluten free meals. I’ve been gluten free for three years. I liked Simply Gluten Free Magazine on FB! Just getting started with the lifestyle change; my son may have an allergy, and my immediate and extended (blood-line) family has tons of food allergies. I just started following you and “Simply Gluten Free Magazine” on FB. Can’t wait to dig deep into the site! :) Thanks! I have been gluten free since June of 2011! Never felt better! So nice not to be sick all of the time. I like simply gluten free magazine on facebook! I have been gluten-free for 5 years and my husband (who has celiac) has been gluten-free for a year and a half since his diagnosis. I am soo excited for the release of the magazine! I am now following Simply Gluten Free Magazine on facebook. My daughter, (she turns 6 this Sunday!) who has Tuberous Sclerosis, seizure disorder, and Autism started going lactose/dairy free back in March 2012. I decided (without any support from her G.I. Doctor) to take her gluten free as well. We’ve seen HUGE leaps in her speech/language over the summer. (I only took her TOTALLY gluten free since June 2012). So this venture is still very new to us and I’m still “figuring it out”!! But so far… it’s totally worth it! I have been Gluten-free for over 3 years. Also, do not eat dairy, soy, sugar and some oats! I am now following Cook It Allergy Free on facebook. This should help with new ideas of what to make. I just followed both Cook it allergy free and SImply Gluten Free magazine. Thanks! I’ve been gluten-free for so many years that I’ve lost track of how long I’ve been gluten-free. I think it’s over 6 years. We have been gluten-free for 3 years now and just recently are trying out paleo. This looks like a wonderful magazine and I’m very excited for it to come out. We’re going gluten free next month, when school starts up again. Tummy troubles and ASD diagnosis for my son are good indicators that we should give it a try! I like Simply Gluten Free on facebook! My gluten free and dairy free journey is just starting and I’m finding it to be very scary because I’ve never had to do anything like it before. I’m really glad that there are websites, magazines and cookbooks available for me to read through to help me make this tough transition. We are just starting our gluten free journey and are at 2 weeks. I like Simply Gluten Free on FB. I like Cook it Allergy Free on FB. I have been gluten free for three months. My 15 year old daughter has been gluten free for 6 months. This has made a huge difference in her life! I follow Simply Gluten Free Magazine on Facebook and I subscribed! My mother was recently diagnosed with Celiac disease so we are now following the magazine! I think this will help her alot!! I have had my special little one on a Gluten and Dairy free diet for 8 months. We make the majority of our dinners to fit his needs as well. Hi! I’ve only been gluten free for about 5 weeks and it has changed my life. I’m hoping to win the cookbook, because I’ve just about run out of my repertoire of interesting things to eat that are gluten free (I usually just cook all my food at home, so plain protein and veggies mostly). I am already following Simply Gluten Free on Facebook as well, which is how I found out about this! I have been gluten free for 10 years. I follow both you and the magazine on Facebook already!! I follow both on fb and we have been eating gf for almost 3 years. My 8 year old daughter has celiac disease. Been GF for 2 1/2 years! I just started my gluten free journey about 2 months ago. I need all the recipes and information I can get! I have been gluten free for over a year. I follow you on Facebook; love the recipes! I follow the magazine on facebook, and am looking forward to using it! I follow Simply Gluten Free on Facebook, and will follow your page free leaving this comment. :-). I have been gluten-free for a week now (I was just diagnosed with celiac, am also type 1 diabetic and hypothyroid), and with this hanger plus a change in y thyroid medication, I am starting to feel better!! I an looking into getting tested for other food allergies/sensitivities. I own the book and I have already subscribed to the magazine but I wanted to leave a comment and say how absolutely excited I am that this magazine is coming out! I have been GF for just over a year and I had no idea how much bad effects gluten was having on me. I miss it terribly in certain cases but I feel so much better than I did before that I have never once been tempted. For those of you just starting out, it’s hard but stick with it and you will be amazed at how much better you feel and how much more you can do! And I LOVE the mag on Facebook! I just liked your page on Facebook – looking forward to seeing more! I’ve been GF since Nov 2011, when I found out. It’s not been easy! I already follow Simply Gluten Free Magazine on FB (Deb Dianne). My household has been gluten free almost 3 years. My husband has a severe allergy to gluten and everyone feels better since making the switch. I have been gluten free for 6 years now! What a great giveaway! Carol’s was one of the first blogs I came across, and I’ve followed her since! Now following Simply GF Magazine on Facebook. I’ve only been gf for a few months.i find it really difficult to adjust as i have many other diseases/illnesses also. My husband is set in his foodeating ways so i generally have to cook two meals.one for him and one for myself.i would love to find some recipes that could be my middle ground so i can finnd things he would eat also. And a few quick mesls or that i could make freezer friendly would be great as some days that i cant get out of bed to cook! Looking forward to the book and the magazine! I already like both fb pages! My son has been gluten free for 7 years since he was 3 years old. I found out, I probably need to be gluten free too since last year, So I’m starting to eat gluten free lately. Following you on FB and loving the advice and recipes!!! I was diagnosed celiac last november and have been gluten free ever since! I’m now following both Simply gluten and Cook it allergy free on FB. I have been gluten free for over 3 years now. I finally convinced my daughter at 15 to try gf to see if it helped her eczema. It cleared her up. She has been gf for over a year! I’ve been gluten-free and dairy-free for almost 3 months and can definitely tell the difference. I am already following Cook It Allergy Free and Simply Gluten Free Mag on FB. I already had LIKED Cook it allergy free on fb. Liked magazine on FB. Looking forward to getting the subscription. I have been gf for just over 5 years. I liked Cook it allergy free on FB. I’ve been Gluten Free for 6+ years now and feel so much better! I’m now following you on FB (Cook It Allergy Free & Simply Gluten Free Magazine) as well. Looking forward to the magazine and slowly converting the rest of my family to GF living! I already follow Simply Gluten Free Magazine on FB. I have been Gluten free for almost a year. Was diagnosed with Celiac Disease & Dermatitis herpetiformis which can come from having Celiac. I also had a lot of the other problems that come with the disease such as RA. Since going gluten free most of the problems have gotten a lot better. GF is a journey – and we’re still relativity new to it but we are jumping in whole heartedly! I’ve been gluten free since the first of the year, eating primal. Love it!! I’ve lost 20 pounds, and eat all that I want. My son, 20, was diagnosed his last year of HS, hasn’t been easy, but I am trying to get the whole family to eat gluten free, more fresh produce, healthier food. I try to read everything I can and gather as many recipes as I can. I picked up the first issue and loved it! Would love to win a subscription. This magazine looks cool. I’ve been wheat-free for 10 1/2 years and strictly gluten-free for 2 1/2 years. I have your iPod app and follow you on Facebook. I like the Simply Gluten Free Magazine on Facebook. I follow both on fb! I’ve been gf for 1 1/2 yrs-I’m so thankful that there are people like you that experiment with recipes to help those of us that don’t have the patience to do it! I’m a follower of the magazine on FB. I’ve been gluten free for about 8 years now. I have been gluten free for over 12 years now and seen some amazing changes in awareness and recipes over the last decade, but have been anxiously waiting for someone to do something like this! I love the magazine idea…I can’t wait! Also, I love that the cookbook makes other allergies easier to deal with. Good luck! I’d been doing a pseudo gluten free for a while but recently diagnosed with ibs and told to go full on gf. Last week more testing was done after much more pain and now I’m also dairy free. Been looking into paleo as well. Love being able to get such wonderful resources with such ease. Thanks! I have been gluten free since Feb. of 2012. I feel so much better and love your recipes. I do follow Simply Gluten Free Mag on FB already. My 11 year old was diagnosed several weeks ago and we are feeling overwhelmed and broke due to the increased cost of our groceries. So grateful for information that you provide, I am brand new to all of this! Thanks! Diagnosed with celiac a year and a half ago. Developed an allergy to rice after going gluten free. So most of the gluten free products out there I am unable to eat. A very challenging chore going to the grocery store. Looking forward to this new magazine with all the recipes that I can try. Already like Cook it allergy free and simply gluten free on fb. Have been a follower and just purchased the magazine. Would give the free one to a friend. I have been gf for a little over 5 years. I have been cooking GF for 7 seven years for my DD. I have been GF myself for 2 years. I love to try new recipes. Incorportating more gf meals in our lives as it helps me feel better. My daughter has other allergies/food sensitivities that we are working around as well. We’ve been gluten/dairy/soy free in this family of 5 for the last 2 years! Oh and I follow you on FB too! Hi, I have been eating gluten-free for the past 12 years. Lately I have had to take dairy and beef out of my diet as well. I was already a follower of Simply Gluten Free magazine on Facebook. I am now “liking” Cooking Allergy Free on Facebook – looking forward to finding some interesting stuff there. I am looking forward to seeing this new magazine. New recipes and ideas are always welcome in my house! I follow you on FB, and have been GFDF for almost 7 years! It is getting easier. I follow Simply Gluten Free on Facebook! Just started gluten- free 6 weeks ago and wish I’d started years ago – feel so much better! I’ve been toying with gluten/allergy-free recipes for the past couple years as I try to control some of my gut symptoms with diet. This book looks awesome! Great giveaway! I follow SImply Gluten free on Facebook, and cook for 2 Celiacs for the last 3 years. I found out November 21, 2011 I had Celiac’s Disease. When I found your website, I started following you. I follow you on FB, follow Simply Gluten Free Magazine facebook page, and follow you on Cook It Allergy Free’s facebook page. I have also entered your contests on simplygluten-free.com for the Gluten Free Flour and Dessert Cookbook and also The NEW Third Generation iPad Giveaway. At this point, anything that helps!!!!!!!!!!!!!!! I follow you on Facebook, Cook it Allergy free…Great ideas from great minds! Thanks! Forgot to say that I followed both on facebook! My 6-year old daughter and I have been gluten free since Jan 2011. I follow Cook it Allergy Free! For about 3 months now we have been working on GF,DF, SoyF. With 2 of us figuring out how to eat and 2 not needing to have any restrictions it has been a bit slow! “liked” Cook it allergy free. “liked” SGF Magazine just last week. So excited to see this magazine! My daughter has just discovered she’s gluten sensitive at 20. After years of preparing food with gluten, this has been a challenge. It’s nice to find resources to encourage her. Thanks! I am Gluten Free 3 yrs! I am a volunteer for GF Expos and events! I am also entering contests, meeting great people, educating myself and others, and loving it! <3 Hugs! Please be sure to vote for best Tshirt on NFCA website for Appetite 4 Awareness T-Shirt contest…Gluten Free Event Sept 23, 2012 in Philly at Strawbridge Bldg. My shirt is one of the finalists and voting is taking place on FB until Aug 24th so pls vote! Thx! Following you on FB too…Simply Gluten Free- now why didn’t I think of that! BOL2U! I’ve been gluten-free for one year this month. I liked Simply Gluten Free Magazine on FB. Looking forward to reading the first issue! I was diagnosed with celiac disease in 1983 and have followed the gluten free diet faithfully since then. Ive been gf for 1 1/2 years. Seems like forever and yesterday all at the same time. I’ve only been gluten-free (officially) for 1 week since I just started my first Whole30…! I’m impressed by those that have been doing it for years! I’m now following you on facebook. I’m now following Simply Gluten Free Magazine on Facebook as well. I’m allergic to wheat and have been gluten free since July 10th! Am learning lots and feeling so much better! Ok duh! i just read that i have to do a diffrent post for all my entrys LOL ok so the first one will be for following you and this one is for following simply Gluten Free. Here’s another one for being Gluten Free for 7 years LOL sorry about that. I’ve been gluten free since Christmas 2007! Thanks for offering the giveaway! I’ve been gluten, soy, and dairy free since April 2011 and am continuing to add to the allergens with eggs. Now also following the magazine on Facebook too! So I told you I have been gluten free since November . I have been wheat free for 4 years now. I follow you on Facebook, I never even heard about Gluten free till we were Blessed with not one but two wonderful Autistic grand children ( one whom we are raising) they are both on oppisides of the spectrum ( they are from two different daughters as it is a blended family) as well as different allergies! I love making the new an wonderful foods and it always makes me happy to see them bloom and eat! the changes to our own health as we go along with the diet are amazing as well. Thanks for putting out such wonderful information! My husband just found out he is gluten intolerant so I just started exploring the gluten free world recently. Thank you for offering such great information to people who are searching for answers! BTW, I didn’t follow COOK IT ALLERGY FREE or SIMPLY GLUTEN FREE MAGAZINE before, but I do now! I just started eating gluten-free in May! This prize would really help me figure out some tasty, easy recipes to cook up for myself! I’ve been gluten free for just over 2 years. I’m a FB fan of your site. I have been gluten-free for 2 years, I am also dairy and egg free so always looking for new recipes. I like the magazine of facebook- under Jodi Castallo. I also liked Cook it Allergy Free on facebook- Jodi Castallo. My two oldest kids are gluten free. My oldest daughter has to gluten and dairy free. They have been gluten free for 2 years now. I would to win because it would give me more options for them. I’ve been gluten-free for about 10 years. Already follow Simply Gluten Free Magazine on FB! And advice I can get! Can’t wait to see your magazine! I have “liked” both pages on Facebook. Yay!!! I was diagnosed with celiac disease in late March of this year–so I have been gluten free for 5 months. Still have a lot to learn! I just “liked” the new magazine link. I have been working on a gluten-free life (not always as diligently as I should) for about 2 years. I just liked “Cook It Allergy Free” on facebook. I am gluten free almost 2 1/2 years. My reason was due to a cancer diagnosis unlike others who are sensitive to gluten. Works for me. I still have to adjust recipes to eliminate sugar. I have been gluten free for 1 year & 10 months. I will follow both facebook pages! Looking forward to a new magazine! I’ve been GF and Dairy Free since July 27th! 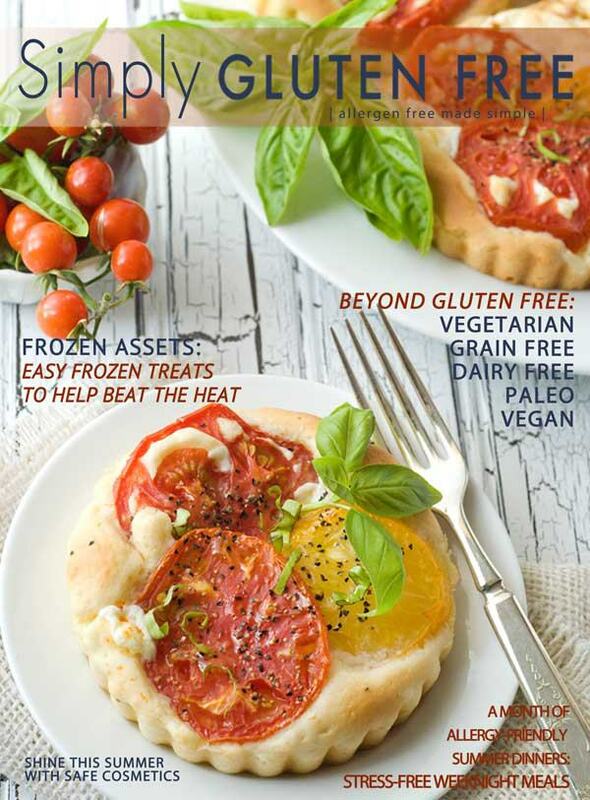 Liked Simply Gluten free Mag on FB! Also liked Cook it allergy free on FB! I am a new comer to the Gluten- free diet as well as dairy & soy free. This has been a learning experience for me and frustration at first to find products to suit my new diet lifestyle. This magazine would be helpful to me on finding new recipes that I can encounter with healthy foods with good taste . I will enjoy following Cook It Allergy Free & Simply Gluten Free Magazine on facebook. I missed the cooking class at Nature food patch this month looking forward to attending one soon . I just got diagnosed with food allergies last week to my surprise I’m allergic to wheat soy, dairy, nuts, and shell fish. After years of terrible pain and symptoms that I had no idea where symptoms. I’m looking for all the help I can get this magazine looks amazing and full of wonderful ideas. Liked both! Been gf on and off for about 5 years!